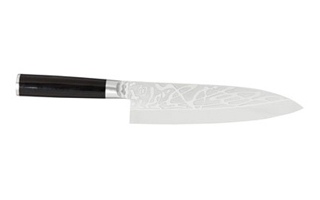 Cutlery connoisseurs value Shun knives because of their extreme sharpness and good looks. 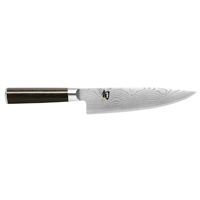 This top quality brand is handcrafted in Japan by knife experts, trained to make only the best. Knives are one of the most important tools for any chef, home or pros, shouldn't you have the best? 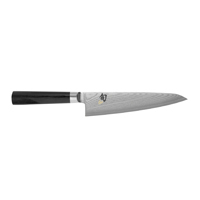 When you invest in a Shun knife, it comes with lifetime free sharpening and a lifetime guarantee. 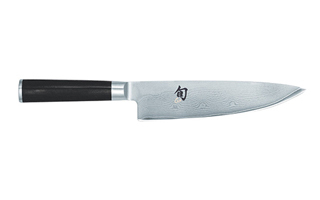 Compare Shun knives. Stunningly beautiful, Kershaw Shun Classic knives have a strong stainless steel core that's corrosion-resistant. 32 layers of additional steel and metals are bonded to it for sharpness, durability and beauty. The ergonomic Shun handle is an easy-to-clean blend of resin and hard birch wood. 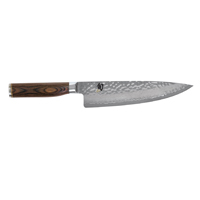 Shun Classic Pro knives are made in the traditional Japanese style with single-bevel blades forged from a single piece of steel. 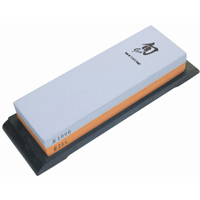 This traditional design is easy to sharpen and maintain with a whetstone. Handcrafted in Japan, these knives have a lifetime warranty. 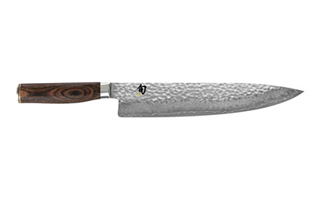 Shun Premiere knives are extremely sharp and durable. 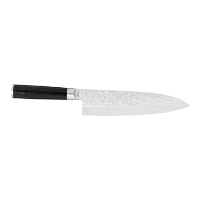 They feature a hand-hammered finish which not only looks good, it helps to keep foods from sticking to the blade. A warm walnut finish on the germ-resistant resin and wood handle adds to the rich look of the Shun Premier knives. Shun knives are always innovating. We especially love their latest creation, Kanso. These incredibly sharp knives have a stunningly rustic handle made from Tagayasan wood. The blade, too, also evokes a rustic feel with a unique heritage finish. Handcrafted in Japan. 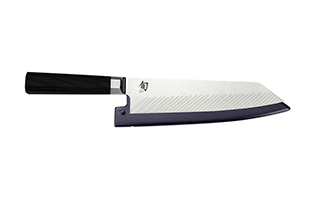 Shun Dual Core was named "Kitchen Knife of the Year" by the Blade Show. Dual Core is Shun's most innovative and sharpest style. Of course, handcrafted in Japan! You can save as much as 20 percent when you purchase a knife set vs. buying individual open stock knives. 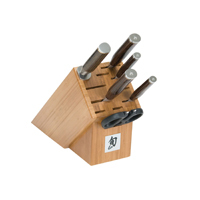 Browse our complete selection of Shun knife block sets, ranging from 6 piece to 23 piece cutlery sets. These Shun knives have traditional Japanese shapes and construction. Shun Blue has a core of carbon steel totally enveloped with stainless steel, so you can enjoy great sharpness, easier re-sharpening and low maintenance. Blue steel knives from Shun are handcrafted in Japan and have a lifetime warranty! Handcrafted in Japan, Sora cutlery from Shun features the same super-sharp steel edge of their Classic series at a more affordable price. Sora blades feature a combination of a stainless steel blade with a VG10 "super steel" edge for excellent performance. 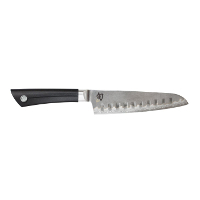 Perfect for any occasion, Shun knife gifts sets are well priced and great performing. A Shun cutlery set makes a great hostess gift, especially at holidays. 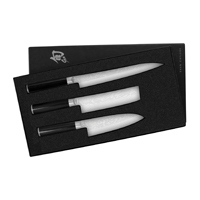 Each knife set comes in a high quality wooden presentation case. 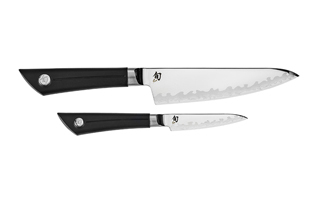 Save big on these specially priced Shun knives available only for a limited time. Keep you Shun knives ready to use at all times. A sharpening steel will re-align the edges of the knife and reduce the need for sharpening. 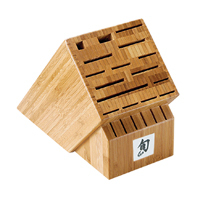 Specially made Shun sharpeners and whetstones are made to handle the 16 degree Asian angle that's on your top quality Shun cutlery. 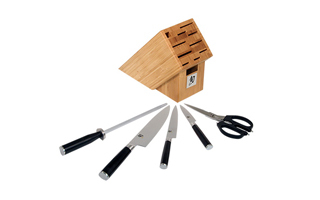 Protect and safely store your knives with a variety of Shun cutlery storage options. Choose between knife blocks, trays, magnetic knife holders or portable professional knife cases, all made to meet Shun high quality standards.